Brin was not in good shape at first, having been deprived of water and food for quite some time but his friendly and hopeful character soon brought about a loyalty and companionship that worked both ways. He was given spare rations once a day which included a raw egg to build up his strength and improve his coat and soon items were sent over to help with fleas and ticks. Brin also enjoyed for the first time rawhides and a toy made from army socks rolled up into a ball. Hi all. 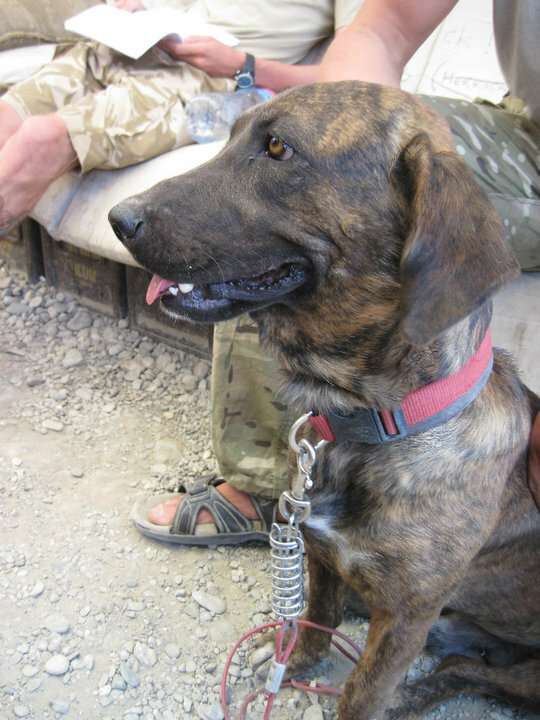 My name is Captain Mark Townend, Brin’s adopted owner in Afghanistan. Given the public interest in this lively and devoted young pup I thought I would write to let all interested parties know how well our lad is doing. Sally will probably be posting a few new photos on the page in a few days which will help get a better idea of who Brin is and how he lives. First and foremost: Brin has filled out since becoming a full time member of the Patrol Base (PB). On a diet of army rations and fresh food when available from the kitchens (twice a day if available) along with a constant supply of clean water on tap Brin has begun to look much healthier. His ribs are gone and his coat has started to shine (an egg a day will do this for any dog owners out there!). In parallel to his health his personality has shown signs of healthy improvement. He has always been friendly to people, especially westerners and soldiers. He has become a keen watcher of humanity, sitting in what shade he can find from the mid day sun and watching the world pass him by, wagging his tail occasionally at someone he recognizes and enjoying the constant head scratching from all who take a second to greet him, which is pretty much everyone! 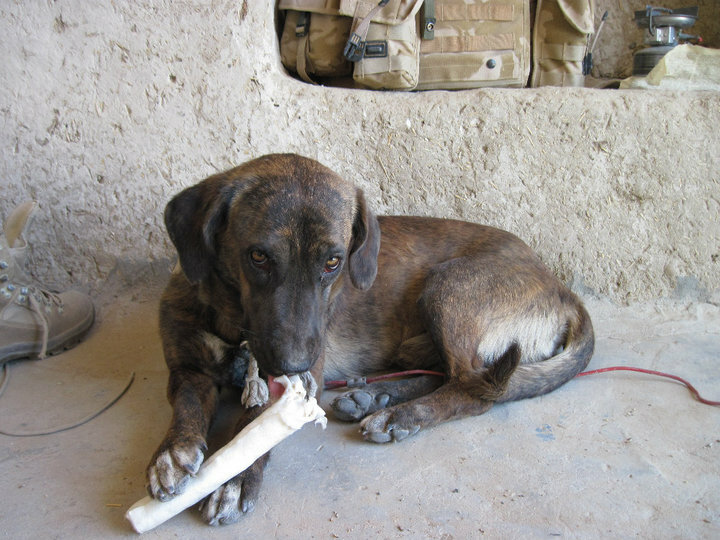 Most encouragingly, he has recently begun playing: Something that afghan dogs are alien to in the way we would know. He has been gifted a tennis ball from home which he takes great delight in chasing when thrown in the air and retrieving back to his “safe” area for a re-throw! This has shown a retrieving instinct that bodes very well for his home training in his future life. 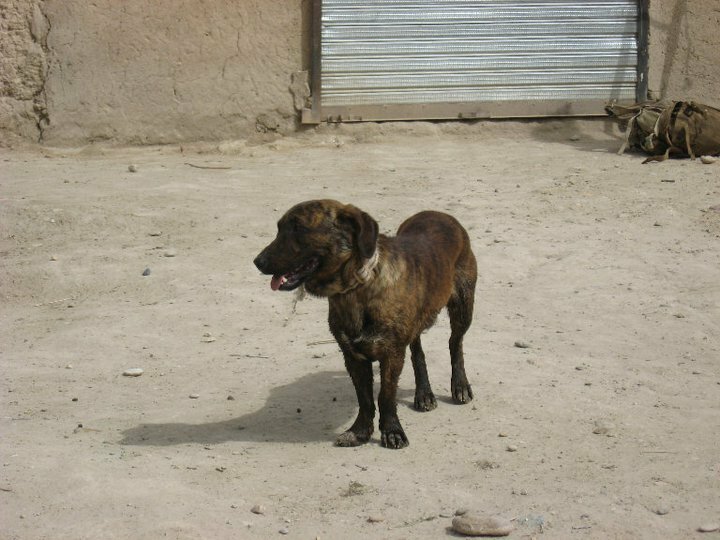 He is suffering somewhat in the summer afghan heat (as all dogs do) and is relatively lethargic in the day time until the evening cools off a little and allows him to perk up. He will definitely enjoy a change of climate on his move to UK soil and he will likely become far more active in cooler day time temperatures. He usually walks the perimeter of the PB first thing in the morning and last thing at night when the temperatures are coolest which is his exercise routine for the day. He will be looking forward to longer walks in the UK, and has a natural tendency to walk “to heel” on the lead (although he does like to pull when he sees something that catches his eye!). He is also a relatively clean dog: business is limited to a small area and is always “scrapped over” as best he can manage. He enjoys regular brushing (important given the parasites around the place out here) and will melt in the hands of anyone who takes the time to scratch him between the ears for a few moments. He is friendly with other dogs although his boisterous and puppy-like full speed approach can be misread by more nervous animals: introductions are handled in a relaxed and calm manner to ensure no issues. Once introduced Brin makes friends easily and he loves the company. His best friend to date is a search dog (golden Labrador) named Casper who is always pleased to see him when their daily walks cross paths. In short he is a pleasure to have around, is in no way a burden to our daily soldiering and has shown some very positive signs of being more “civilized” than other afghan hounds with his background. He will blend seamlessly into UK life I am sure. I will post what I can when I can on his progress: my involvement with him stops when he reaches a safe area of afghan and the hands of the next stage carer for his vet checks and eventual flight back to UK. Your support and generosity has made this risky and dangerous journey for him as supported as he ever could ask for and, with your help, if ever a dog had the best chance of making it through the war zone to safety it will be Brin. We will all do all we can on our various levels to do the right thing for our boy: but know that your interest in his story in itself supports his journey and improves his chances. From Brin and myself: Thank you. To Sally and all of you who have contributed to his future and his welfare. Never could either of us imagined such a response to his story. He proved to also be quite the ‘escape artist’ often to be seen off base running after patrols and trotting about without a care in the world which was not the best thing to do in that area! So, Brin had to learn to stay put by being tethered outside the sleeping quarters where he would wait patiently for Cpt. Mark to return from patrols and they would go for a walk together around the base twice a day. 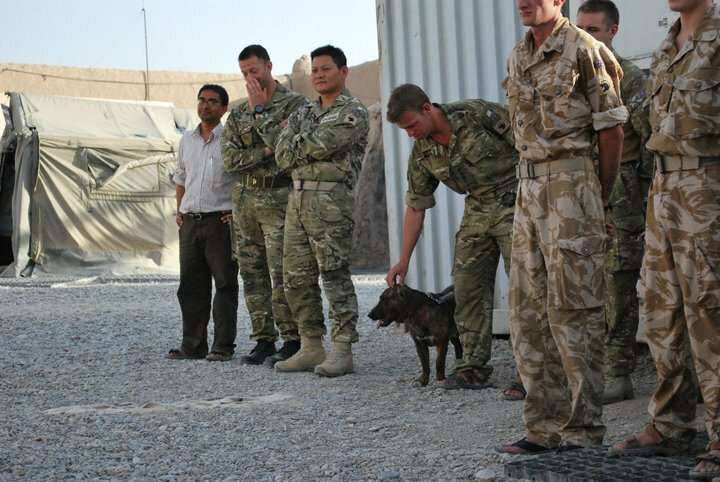 Brin lived with the Gurkha Rifles for many months and, although still a ‘stray’ in the eyes of the army, he became part of daily routine and included in many activities alongside his newfound friends. Despite his relative safety there was always the doubt about his future as, for many of the strays from these areas, the outlook is bleak. and for Brin, time was running out.